UPDATE: Cecilia just got in touch about a major victory for her group, Queens Neighborhoods United who has been fighting the construction of a Target in their neighborhood. Check out the details. 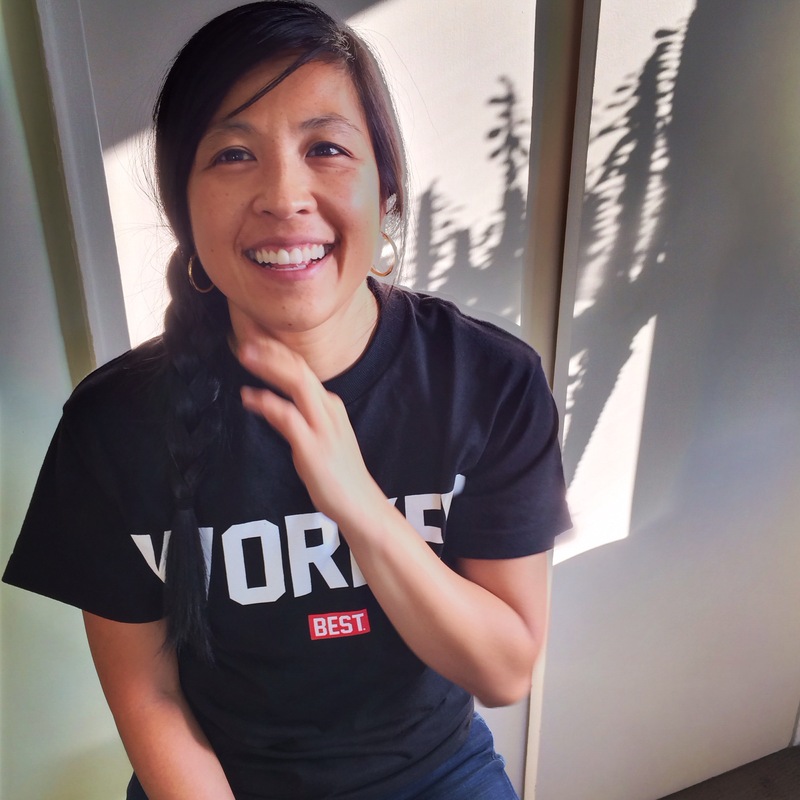 Cecilia Lim is a Queens-based artist, designer, and community-based trainer and capacity builder who believes that we thrive when we connect to ourselves, each other, and our environment. Cecilia is a community care and cultural worker with Ugnayan Youth for Justice and Social Change (a core partner of Hate-Free Zone Queens [HFZ]), and recently helped launch a successful action with HFZ and Queens Neighborhoods United. Read her alumni interview, for successful campaign insights and part of her journey as the daughter of immigrant parents, all of which speak to the heart of NYC’s fight for justice and neighborhood grassroots change today. As the first generation US-born daughter of immigrant parents from the Philippines, with both Pinay and Chinese heritages, Cecilia Lim has a rich family history of migration and social justice. She pursued meaningful social change by working for years in non-profit and government sectors, within communications and media, advocacy and education, project and program management, and peer counseling, but the arts kept calling out to her. But the arts had a purpose Cecilia could not ignore, and through her use of peer counseling and the support and encouragement of her community, she decided to take a chance to follow her dream of centering creative work in her life. After leaving her government job in 2015, Cecilia travelled to the Philippines. There, she connected with a small group of organic farmers and learned about the concept of permaculture, where “one of which the main ideas is to amplify your impact in the world and strengthen the cohesion and the interconnectedness by trying to overlap the different things you have going on.” Inspired by this concept, she returned to Queens, NY, and searched for ways to integrate community-based work, peer counseling, project and program management, and all of her creativity. Photo by Cecilia Lim: Community members summon Lady Liberty during C4AA final Art Action Academy 2017 Queens project “Hate-Free School of Magic and Wizardry,” Jackson Heights, Queens, NY. 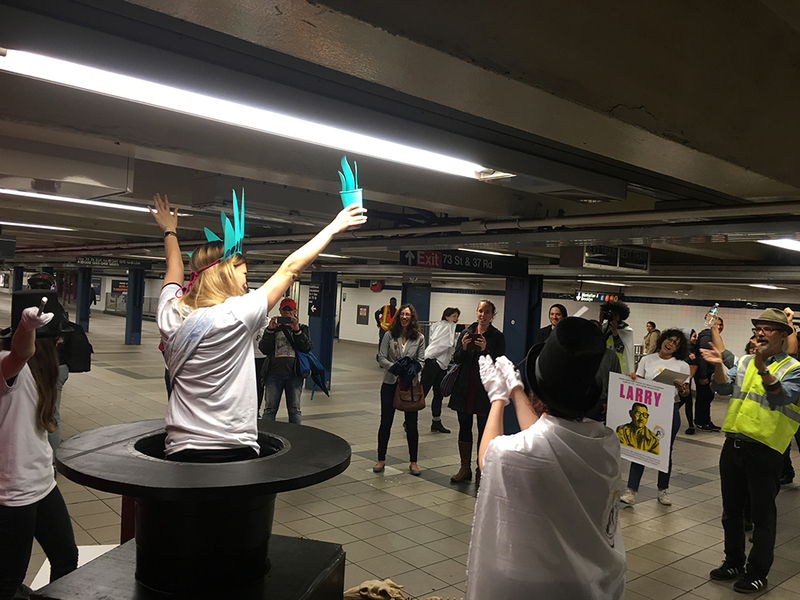 The final project was the “Hate-Free School of Magic and Wizardry” an interactive public participatory magic show performed in the 74th St-Roosevelt Av subway hub in Jackson Heights. “ICE” was made to melt/disappear; community members re-wrote the Muslim ban; and Lady Liberty was summoned to rally community members to “Love and Protect Each Other.” At the end of each show, community members were invited to get involved in building a Hate-Free Zone, and a flyer was distributed with HFZ core partner organizations’ contact information. While this action took place in her home community of Jackson Heights, a challenge in continuing the relationships with other alumni in this training is that they came from all over for this Art Action Academy. “Understanding that building broad community is part of the larger vision,” however, keeps Cecilia engaged in the process of growing the connections with her AAA cohort. Cecilia continues to focus on building community with arts and cultural workers to maximize the potential collaborations for social change and has incorporated tools from her AAA training into her work with HFZ, primarily working in Jackson Heights and the immediately surrounding neighborhoods of Corona, Elmhurst, and Woodside. HFZ values the power of arts and culture to uplift, unite, and transform people both individually and collectively. As a key part of Cecilia’s community care and cultural work with Ugnayan, she is part of the HFZ team that finds and creates opportunities to and engage community members and institutions with arts and cultural work to become part of HFZ. Photo by Daniel Cardenas (QNU): Multiple generations of community members participate in the “I wish this was a” art action collaboration between Hate-Free Zone Queens and Queens Neighborhoods United, Elmhurst, Queens, NY. 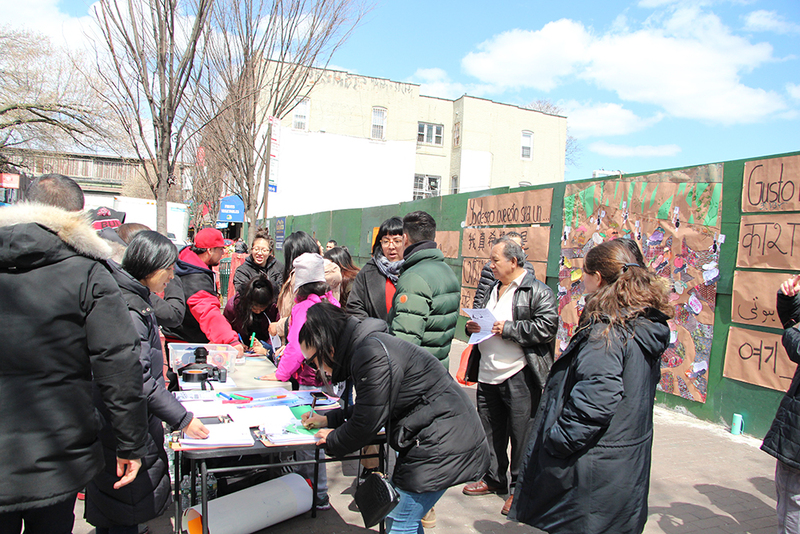 Photo by Daniel Cardenas (QNU): Accessible affordable housing, a center for young people: Community members make public and visible what they want to be built at the 82nd Street site in Elmhurst, Queens, NY. The “I wish this was a” art action really propelled QNU’s anti-displacement campaign; gave QNU further credibility within the community; and was significant in bringing the campaign to this current moment – the developer has withdrawn its application to build unaffordable housing! However, the fight is not over: the plan for building the Target is still in place. 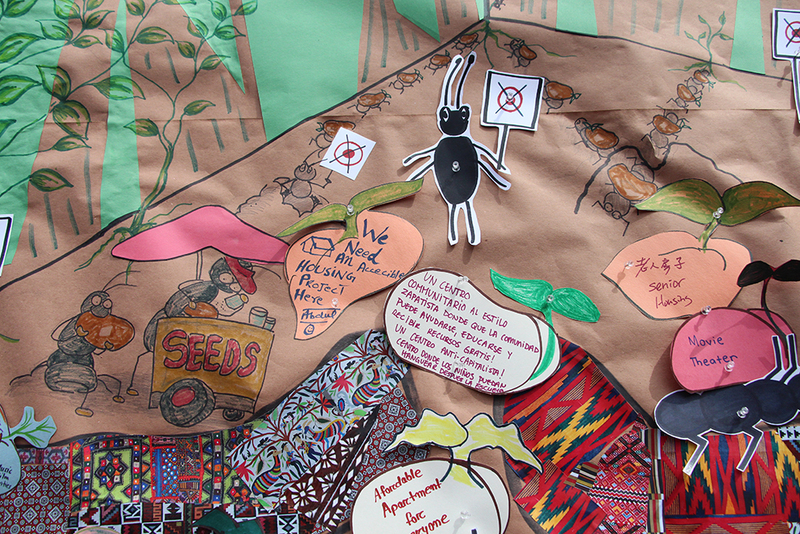 QNU is strategizing their next steps to make some of those ideas community members wrote on the seeds a reality. For campaign updates, please visit QNU on Facebook. Having participated in the Art Action Academy has connected Cecilia to other alumni in unexpected ways. “I went to a panel and the great thing was I was able to connect with Tomie Arai who was a 2016 graduate of the Art Action Academy and also a founding member of the Chinatown Art Brigade Collective. She invited HFZ to be part of the session they were doing at Open Engagement, and they were very clear about centering the work being done in Queens.” It was a great opportunity to speak with other creatives about the work being done in Queens. Any ideas, answers, or questions? We want to hear from you. Please write us and continue the collaboration. “There is so much emphasis on process and on the strength of social justice movements being about the relationships that we have with each other. And I know from experience that we can certainly move without having great relationships with each other, you can put that interpersonal work on hold… but we move so much farther and so much faster and so much more enjoyably when we do have strong relationships with each other. And we build those strong relationships by being involved in all aspects of the work.” Cecilia Lim, Arts Action Academy Alumni, 2017.